Initially announced in 1947, the Marshall Plan was a U.S.-sponsored economic-aid program to help Western European countries recover following World War II. Officially named the European Recovery Program (ERP), it soon became known as the Marshall Plan for its creator, Secretary of State George C. Marshall. The beginnings of the plan were announced on June 5, 1947, during a speech by Marshall at Harvard University, but it wasn’t until April 3, 1948, that it was signed into law. The Marshall Plan provided an estimated $13 billion in aid to 17 countries over a four-year period. Ultimately, however, the Marshall Plan was replaced by the Mutual Security Plan at the end of 1951. The six years of World War II took a heavy toll on Europe, devastating both the landscape and the infrastructure. Farms and towns were destroyed, industries bombed, and millions of civilians either killed or maimed. The damage was severe and most countries didn’t have enough resources to help even their own people. The United States, on the other hand, was different. Because of its location a continent away, the United States was the only country that did not suffer major devastation during the war and thus it was to the U.S. that Europe looked for help. From the end of the war in 1945 until the beginning of the Marshall Plan, the U.S. provided $14 million in loans. Then, when Britain announced that it could not continue to support the battle against communism in Greece and Turkey, the United States stepped in to provide military support to those two countries. This was one of the first actions of containment outlined in the Truman Doctrine. However, recovery in Europe was progressing much slower than initially expected by the world community. European countries compose a significant segment of the world economy; therefore, it was feared that the slow recovery would have a ripple effect on the international community. Additionally, U.S. President Harry Truman believed that the best way to contain the spread of communism and restore political stability within Europe was to first stabilize the economies of Western European countries who had not yet succumbed to communist takeover. 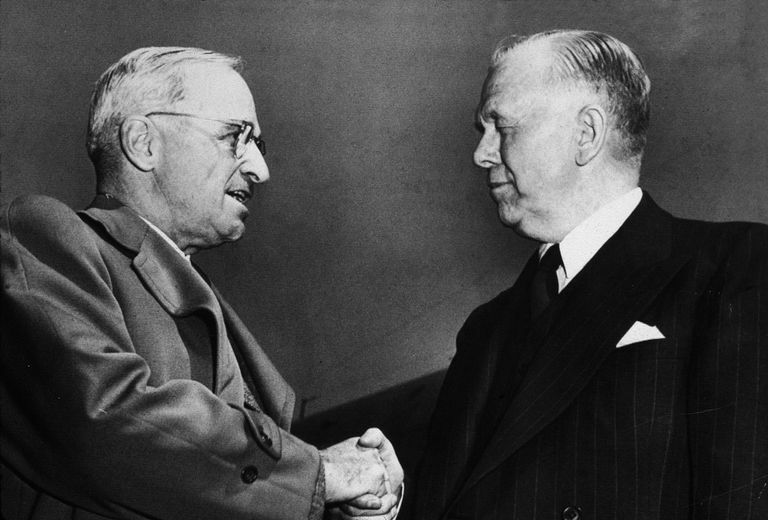 Truman tasked George Marshall with developing a plan to carry out this goal. Secretary of State George C. Marshall was appointed to office by President Truman in January 1947. Prior to his appointment, Marshall had an illustrious career as the chief of staff of the United States Army during World War II. Because of his stellar reputation during the war, Marshall was viewed as a natural fit for the position of secretary of state during the challenging times that followed. One of the first challenges Marshall faced in office was a series of discussions with the Soviet Union regarding the economic restoration of Germany. Marshall could not reach a consensus with the Soviets regarding the best approach and negotiations stalled after six weeks. As a result of these failed efforts, Marshall elected to proceed with a wider European reconstruction plan. Marshall called upon two State Department officials, George Kennan and William Clayton, to assist with the construction of the plan. Kennan was known for his idea of containment, a central component of the Truman Doctrine. Clayton was a businessman and government official who focused on European economic issues; he helped lend specific economic insight into the plan’s development. The Marshall Plan was crafted to provide specific economic aid to European countries to revitalize their economies by focusing on the creation of modern post-war industries and the expansion of their international trade opportunities. Additionally, countries used the funds to purchase manufacturing and revitalization supplies from American companies; therefore fueling the American post-war economy in the process. The initial announcement of the Marshall Plan occurred on June 5, 1947, during a speech Marshall made at Harvard University; however, it did not become official until it was signed into law by Truman ten months later. The legislation was titled the Economic Cooperation Act and the aid program was called the Economic Recovery Program. By 1951, the world was changing. While the economies of Western European countries were becoming relatively stable, the Cold War was emerging as a new world problem. The rising issues related to the Cold War, particularly in the realm of Korea, led the U.S. to rethink the use of their funds. At the end of 1951, the Marshall Plan was replaced by the Mutual Security Act. This legislation created the short-lived Mutual Security Agency (MSA), which focused not only on economic recovery but also more concrete military support as well. As military actions heated up in Asia, the State Department felt that this piece of legislation would better prepare the U.S. and its Allies for active engagement, despite the public mindset that Truman hoped to contain, not combat communism. Today, the Marshall Plan is widely viewed as a success. The economy of Western Europe rebounded significantly during its administration, which also helped to foster economic stability within the United States. The Marshall Plan also helped the United States prevent the further spread of communism within Western Europe by restoring the economy in that area. Concepts of the Marshall Plan also laid the foundation for future economic aid programs administered by the United States and some of the economic ideals that exist within the present European Union. George Marshall was awarded the 1953 Nobel Peace Prize for his role in creating the Marshall Plan. What Caused the Post-War Economic Housing Boom After WWII?